Get My Gentle, Proven Sleep Coaching Tips Now! Download my FREE "Getting Started with The Sleep Lady" guide and learn why crying-it-out isn’t your only sleep training option. 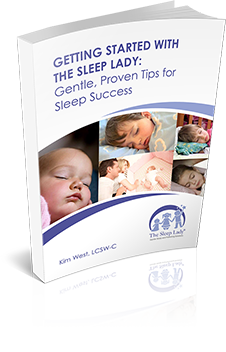 Kim West, LCSW-C, better knows as The Sleep Lady®, is a practicing family therapist and the world's foremost expert on children's behavioral sleep problems. She's the bestselling author of 'The Sleep Lady's Goodnight, Sleep Tight' and creator of the gentle and effective sleep method 'The Shuffle'. For over 20 years Kim has helped tens of thousands of tired families, just like yours find sleep again. Learn more about how you can improve your child’s sleep with my proven tips. When you download my FREE guide you’ll also receive weekly sleep articles ranging from nap schedules and best swaddling practices, to how to survive sleep regressions and wean nighttime feedings — everything you need to know about sleep for newborns to children up to 6 years old. Introduction to my gentle, proven sleep coaching method "The Sleep Lady Shuffle"
“I just wanted to say a big thank you for the Sleep Lady Shuffle. It has truly turned our house around for the better. Our daughter is sleeping through beautifully and time nap is simple and trouble free. She is a happy and well adjusted baby. And happy well adjusted and rested parents to boot!” Sara P.